Author Professor Paul Cartledge talks to us about the long-lasting legacy of Greek Theatre following the recent Cambridge Greek Play performances. 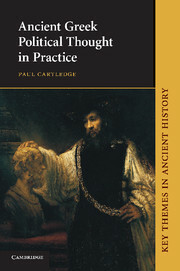 Paul Cartledge is author of Ancient Greek Political Thought in Practice (2009). He is the inaugural A. G. Leventis Professor of Greek Culture in the University of Cambridge. His many publications include The Cambridge Illustrated History of Ancient Greece (1997, rev. 2002) and The Cambridge World History of Slavery (2011) . He holds the Gold Cross of the Order of Honour (Greece) and is an Honorary Citizen of Sparti, Greece.